Asbestos is a known human carcinogen. Extensive epidemiologic evidence demonstrates that inhalation of asbestos fibers can lead to pleural or peritoneal mesothelioma, lung cancer, asbestosis, and other diseases which are serious, irreversible, and often fatal. Asbestos has been responsible for premature deaths of many persons who worked with the same types of insulating materials found in our public buildings. 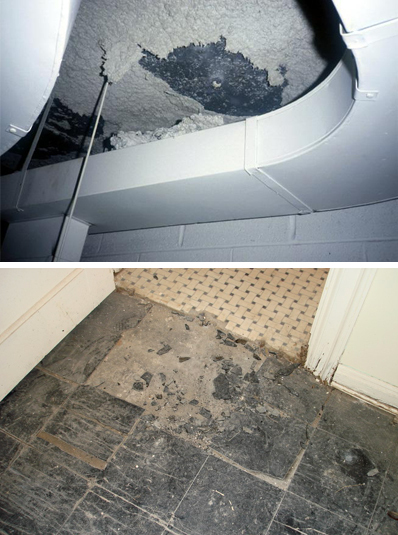 When asbestos becomes friable (easily broken or damaged), a slight pressure or disturbance will release microscopic fibers into the air. Airborne fibers are readily inhaled. Since asbestos fibers are microscopic, they can slip through the lungs’ natural filtration system. The human body can cleanse itself of many toxins, but once asbestos fibers are inhaled or ingested, they remain in our bodies. Asbestos fibers penetrate human tissues, eventually causing cellular damage, which can lead to cancer and other diseases. Unfortunately, detection of asbestos-related diseases is difficult since the latency period between exposure and appearance of the disease is sometimes as long as twenty to forty (20-40) years.